3 Jul 2015 Washington, D.C. The president and then-Secretary of State Clinton sought the assistance from domestic and foreign jihadists in spreading the online video lie, added JW President Tom Fitton. Breitbart News spoke to Fitton about newly released Benghazi attack-related documents pried out of the U.S. State Department under a Freedom of Information Act (FOIA) lawsuit filed by JW last September. One of the document shows that the Pentagon received a request for military assets in response to the attack, but the Obama administration seemingly refused. The Obama administration’s initial response explaining the cause of the attack was “immediately determined by top Obama White House officials” contrary to the president’s claim that it was based on intelligence available at the time. “What you have is nothing other than Mrs. Clinton’s statement referencing a video, the White House approving it before it was released and then blessing it, saying, ‘this is our response,'” he added. Fitton noted that President Obama spoke to Clinton during the night of the attack. “I think you can fairly conclude that it was during that phone call that they decided to push the video lie,” he told Breitbart News. “They started soliciting Islamists to promote the video lie — some of the Islamists responded by saying, ‘the video is terrible, the attacks are justified, we should outlaw all criticism of Islam.’ Thank you Obama! This is what we get as a result of your engagement,” he added. The Obama administration refuses to divulge the contents of the phone conversation. The Clinton-led State Department deferred to the White House on the official response to the attack, according to an e-mail sent by a department spokesperson to the aide of a top State Department official and Clinton’s personal aide the day of the tragedy. A separate e-mail sent out later that day confirms that the White House decided to go with Clinton’s statement tying the Benghazi terrorist attack to the Internet video as the accepted overall government response for the night. The “[U.S. government] comment” ended up being “Clinton’s notorious public statement, made hours after the initial terrorist attack, falsely suggesting that the Benghazi assault was a ‘response to inflammatory material posted on the Internet,” notes JW in a press release. Last month, JW released documents showing that the Obama administration was made aware that al-Qaeda was behind the attack immediately after it occurred. Hussain played a role in pushing the rhetoric that the video incited the terrorists attack and in fuelling efforts to criminalize criticism of Islam. 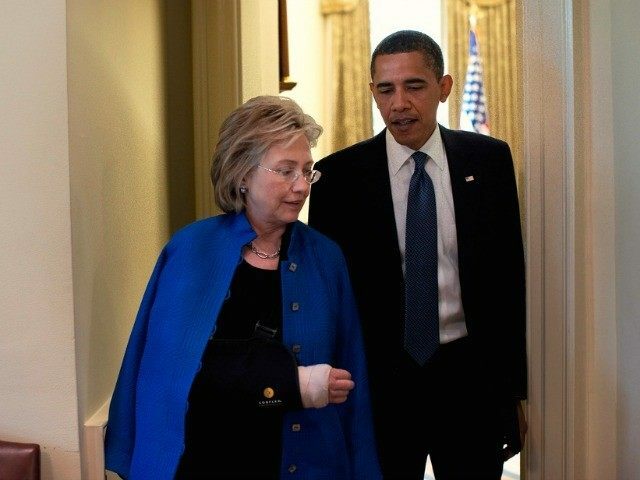 Another document detailed “how the Obama administration reached out to domestic groups, foreign groups and governments in a full-court press to tie the video to the Benghazi attack,” reports JW. U.S. Amb. J. Christopher Stevens, U.S. Foreign Service Information Management Officer Sean Smith, and CIA contractors, Tyrone S. Woods and Glen Doherty were killed in the attack.